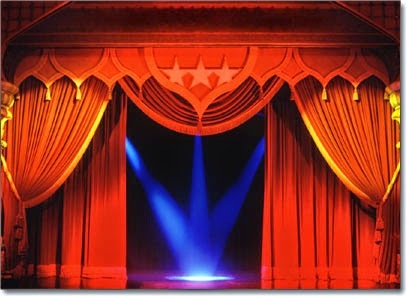 Curtain rises. Teacher seated at desk off-center stage right. Desk lamp offers low light illumination. Indirect spot with pale yellow gel. Teacher spends some time writing, looking up something in books, perhaps on a tablet or computer. Teacher (straightening papers): Well, I think that's it. I think I'm as prepared as I can be. I have my learning objectives, the essential questions on which I want us to focus for the next few days. I've reviewed several resources and prepared activities that I think will engage my students and will help them achieve the objectives. Yes, I think this will do. Lights fade to black. Lights come up off-center stage left revealing tables and chairs. Students enter noisily, chatting and laughing, texting and sharing what's on their phone screens. They settle quickly, still chattering. Teacher enters classroom area from stage right. She places her books on her desk and busily arranges materials. She posts the essential questions and the learning objectives for students. Some of the students watch, but most keep chatting. She turns to the class, squares her shoulders, takes a deep breath. Teacher: Okay, class, let's get started. Immediately students give her their attention. This is well into the school year and they are clear on the processes for class. Teacher: Before we get started, are there are any particular questions you want to raise about the text? Perhaps you have a question that should be on our list of essential questions? Student: Well, I was wondering. . . . and student asks a good questionthat is removed from the learning objectives but is a really great question that raises a perspective or point the teacher had never before considered. Many teachers have experienced something akin to this. A great deal of preparation for a unit plan with clear and specific lesson plans with clear and specific learning objectives. And a clear and specific plan that moves students through the work and offers a fairly clear and specific path to achieve the learning objectives. Then some student asks a completely unexpected question that captures the attention of most of the class and, even better or worse, is an outstanding question. Your brain races and you quickly realize that it might be possible to work towards the learning objectives, perhaps a bit less directly, by pursuing this question. You sense your well-planned lesson dissolving. You feel that hitch of anxiety that something could go terribly awry and yet, well, this is a really good question in which the students seem interested, so you emotionally and mentally relinquish your well-planned lesson plan and roll with it. If only. If only it were that easy, although, for some teachers it is that easy. Why? Well, that's a most interesting and excellent question and I'm not going to get distracted trying to answer it. My point is that teaching isn't scripted. Even when teachers have a sort of script for a lesson plan, it's always mostly a guideline because your 9:12A class is completely different from your 1:37P class. Being able to roll with it means a) knowing your content; b) being comfortable with the learning objectives and knowing there are several ways to achieve any of them; c) knowing your kids; d) knowing your content and having sufficient pedagogical content knowledge to make adjustments on the fly; e) being able to make adjustments on the fly; f) knowing your kids strengths and limitations to build outlines of lessons that take advantage of their strengths and help them manage their weaknesses; and e) knowing your content and your resources so you can make those adjustments on the fly. Sometimes the response to the question is to make note of it, acknowledge its value, suggest the class will get to it later, and return to the regularly scheduled lesson plan. Sometimes the question is intended to get the teacher off-topic because (at least) that student isn't prepared for class; it's remarkable how many of us fall for that. But sometimes the question is disruptive in a really good way and we know we cannot ignore it. Yes, there is a great deal of craft to teaching. There is some science in the art of teaching. But because those students are unpredictable and because some of them just might surprise you, in good and bad ways, the best classroom teachers are able to handle just about anything. And that's why teaching is a whole lot of improv.